Take Me Home Tonight will take you back to the 80’s– 1980’s to be exact. Check out these images of the cast from the film. Check out Tori’s (Teresa Palmer) gorgeous gold dress. Shelly (Lucy Punch) follows Madonna’s fashion trend. 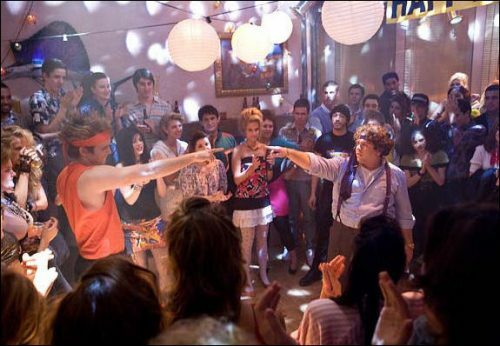 Barry (Dan Fogler) has a crazy dance-off. 80’s supermodel Angie Everhart looks subdued here but makes a wild appearance in the film. Take Me Home Tonight opens in theaters nationwide March 4, 2011.